This weekend will be our first pick up for our Spring CSA. We're excited! We can't wait to meet all our customers and send them home with some awesome chicken! The chickens are ready too--well, their always ready for something, they just don't know what they are getting "ready" for! We have been getting our processing area ready. It was too cold this past weekend to get much of anything ready for this weekend. We were hoping to get things cleaned out and organized but the cold and rain caused that plan to get changed! 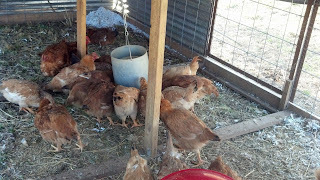 Our chickens are getting ready for their "Last Supper"
We lost a hen this afternoon. I found her on one of the nests. She had just passed away because she was still warm. We're not sure what happened. It looked like she might have been impacted with eggs. This would not be the first hen we lost to this. 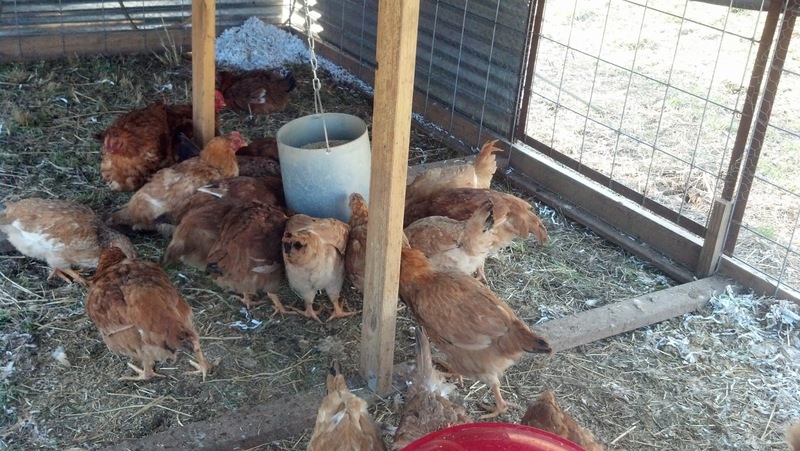 It seems that these chickens are somewhat susceptible to laying problems. They are such big hens! We have noticed that some are heavier layers than others. These are the ones that seem to get compacted with eggs. An Update...Our miracle chicken is still alive! She seems to doing fine. We look for her everyday when we check for eggs and feed. She doesn't go far from the hen house but she doesn't stay still either. We have to hunt for her each day just to check on her!